The governor of Arizona has rejected a controversial bill that would have kept the identities of law enforcement officials temporarily sealed in the event of officer-involved shootings. Gov. 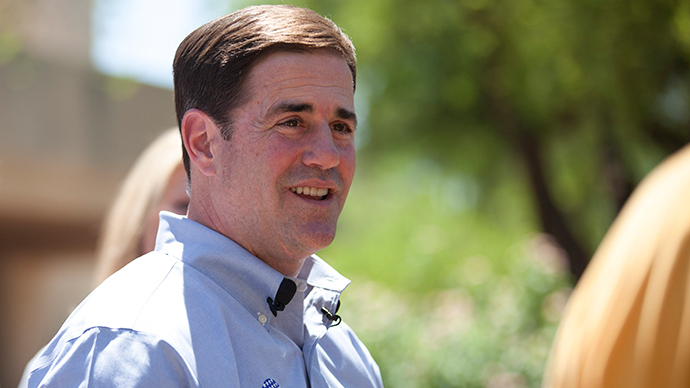 Doug Ducey, a Republican, vetoed Senate Bill 1445 on Monday evening just prior to a midnight deadline. Had he failed to take action, the bill would have established a statewide law mandating that the names of cops would be kept secret for 60 days following any serious or fatal officer-involved incidents. The proposal, backed by law enforcement unions and the Arizona State Legislature, aimed to protect officers and their families from retaliation amid a wave of anti-cop sentiment that has intensified in recent months, prompted by situations including the police-involved deaths of Michael Brown in Ferguson, Missouri and Eric Garner in Staten Island, New York, among others. The State Senate voted in favor of the bill 20-8 on March 24. In a three-page explanation released by the governor’s office on Monday evening, however, Ducey said that he feared that unintended consequences could give way if authorities are forced to stay silent for a two-month span following a serious event. Roberto Villasenor, the chief of the Tucson Police Department in the state’s second most-populated city, had previously urged the governor to veto the bill despite it having received majority approval in the Legislature, as had the state branch of the American Civil Liberties Union, among others. “Enacting legislation that would hamper that trust by not allowing officers’ names to be released is not in my opinion the best way to improve or repair that level of trust,” Villasenor said. “This proposal would have taken Arizona in the wrong direction, by exacerbating distrust between communities and the public safety officers responsible for protecting them, while at the same time eroding the transparency that is critical to our democracy,” ACLU of Arizona Executive Director Alessandra Soler said in a statement celebrating the governor’s late night veto. “There’s no other benefit derived from this other than to protect the name of the officer,” the union leader said, adding that he had been made “livid” by the governor’s veto.